Investment Arbitration is a multi-billion dollar venture. It is an area of international dispute resolution, which has undergone tremendous growth in recent years and resulted in the signature of thousands of Bilateral Investment Treaties (BITs) between foreign states and several Multilateral Investment Treaties (MITs). Numerous disputes involving these instruments are resolved through international arbitration. Arbitral tribunals have rendered many awards ordering the payment of large sums of money. This handbook provides an explanatory introduction into the area of investment arbitration, differentiating it from commercial arbitration and state-to-state arbitration. It examines the legal framework and the general course of an international investment arbitration. In particular, it focuses on the standards of protection in international investment agreements, the concept of jurisdiction in international investment arbitration and the arbitral award, including the notions of recognition, enforcement and execution. Moreover, this cutting-edge publication contains relevant and recent case law in the area and deals with contemporaneous issues such as the ongoing controversy regarding the future of Intra-EU BITs and Free Trade Agreements as well as the link between vulture funds and investment arbitration. 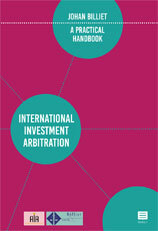 The handbook aims at arbitrators, lawyers, practitioners, academics, students and everyone with an interest in international investment arbitration. It is written by Johan Billiet in collaboration with Maria Elenora Benini, Cari-Dee Le, Amélie Noilhac and Cecile Oosterveen.